Clinton supporters frequently assume that Trump supporters are all racists and sexists. But that margin [of Clinton’s share of the Hispanic vote], based on exit polling conducted by Edison Research, was smaller than the 71%-27% split that President Obama won in 2012. And it was smaller than the 72%-21% her husband, former president Bill Clinton, won in 1996. Trump actually performed slightly worse among white voters than Mitt Romney did. He did, however, perform better than Romney among blacks, Latinos and Asian Americans, making it more difficult to claim that racial resentment was the dominant factor explaining Trump’s support nationally. 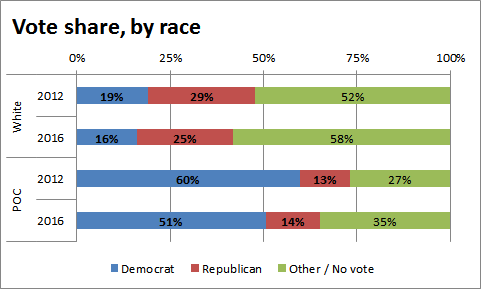 Trump made important gains among black voters as well as whites. Trump performed better with black voters than McCain did in 2008, and on par with Bush’s performance in 2000. And quite a few individual voters and counties that voted for Obama – once, or even twice – voted for Trump. And see this. In reality, many men who hate Clinton would vote for a woman who wasn’t so firmly in the pocket of the establishment. The subtext here is usually that if you don’t chime in with vehement agreement, you’re a racist yourself, and possibly a racist Trump supporter. There are two reasons this talking point is false. From 2012 to 2016, both men and women went from caring about the outcome to not caring. Among Democratic men and women, as well as Republican women, care levels dropped about 3-4 points; Republican men cared a little less too, but only by one point. Across the board, in any case, the plurality of voters simply didn’t care. Urban areas, where black and Hispanic voters are concentrated along with college-educated voters, already leaned toward the Democrats, but Clinton did not get the turnout from these groups that she needed. For instance, black voters did not show up in the same numbers they did for Barack Obama, the first black president, in 2008 and 2012. Remember, Trump won Wisconsin by a whisker. So for this talking point to be true, we have to believe that black voters stayed home because they were racist, costing Clinton Wisconsin. Of the nearly 700 counties that twice sent Obama to the White House, a stunning one-third flipped to support Trump. And so, for this talking point to be true, we have to believe that counties who voted for the black man in 2012 were racist because they didn’t vote for the white women in 2016. Bringing me, I suppose, to sexism. This often vitriolic campaign was a national referendum on women and power. On Election Day, women responded accordingly, as Clinton beat Trump among women 54 percent to 42 percent. They were voting not so much for her as against him and what he brought to the surface during his campaign: quotidian misogyny. In fact, Trump beat Clinton among white women 53 percent to 43 percent, with white women without college degrees going for [Trump] two to one. Here’s my own beef. Liberal feminists, young and old, need to question the role they played in Hillary’s demise. The two weeks of media hyperventilation over grab-her-by-the-pussygate, when the airwaves were saturated with aghast liberal women equating Trump’s gross comments with sexual assault, had the opposite effect on multiple women voters in the Heartland. These are resilient women, often working two or three jobs, for whom boorish men are an occasional occupational hazard, not an existential threat. They rolled their eyes over Trump’s unmitigated coarseness, but still bought into his spiel that he’d be the greatest job producer who ever lived. Oh, and they wondered why his behaviour was any worse than Bill’s. Missing this pragmatic response by so many women was another mistake of Robbie Mook’s campaign data nerds. They computed that America’s women would all be as outraged as the ones they came home to at night. But pink slips have hit entire neighbourhoods, and towns. The angry white working class men who voted in such strength for Trump do not live in an emotional vacuum. They are loved by white working class women – their wives, daughters, sisters and mothers, who participate in their remaindered pain. It is everywhere in the interviews. “My dad lost his business”, “My husband hasn’t been the same since his job at the factory went away”. So, for this talking point to be true, you have to believe that sexism simultaneously increased the male vote for Trump, yet did not increase the female vote for Clinton. Shouldn’t they move in opposite directions?